Melissa Costello is a Transformational Eating Coach & Holistic Nutritionist at Karma Chow. 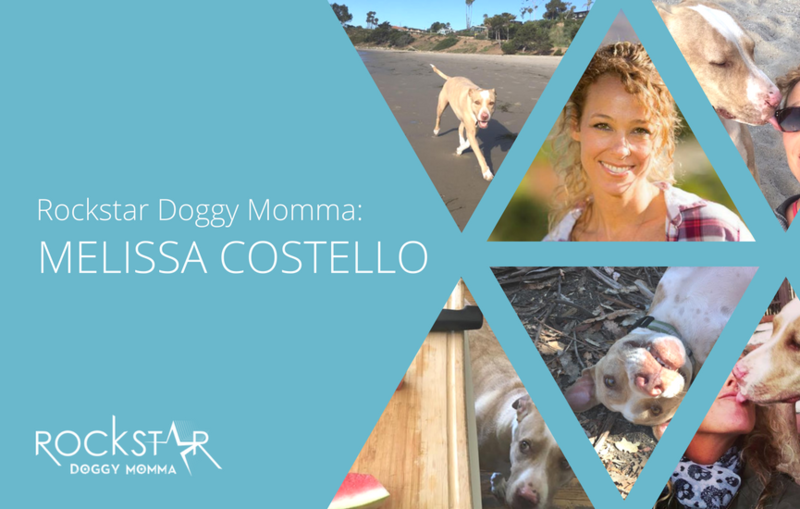 What makes her a Rockstar Doggy Momma? The love and deep connection she has with her dog, Pumpkin! Here’s her amazing story! Tell us the story of how you became a doggy momma! Did something in your life happen that influenced you to get your doggy? I’ve had dogs my whole life and have always been a huge animal lover. Back in 2005 I lost two dogs within a year (both Doberman Pinschers) and I was devastated. I swore that I would never have another dog again, because the heartbreak was too much to bear. After living dog free for three years, I was getting the hankering again to have a fur-baby in my life. 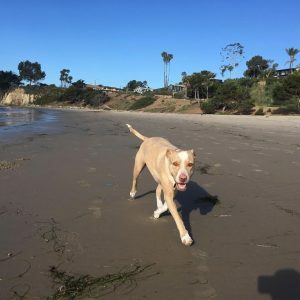 I had been staying with a friend in time of transition and she had a pit-bull, who I fell in love with. I hadn’t had much experience with pit-bulls, and always loved them, but Dobermans were my breed of choice. This pit-bull, Sadie, stole my heart and I felt ready to have a dog in my life again. There was a chance for me to keep her, but I didn’t have a solid living situation at the time, so it fell through for the better. When I got settled into my own space, where I could have a dog (#1 requirement) I started to put feelers out there. I knew I wanted a pit-bull mix. 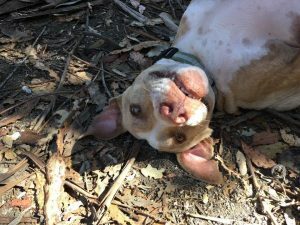 I contacted a rescue in LA called Karma Rescue that specializes in Pit rescue, and my business is named Karma Chow, so I thought it was perfect. I looked on their site and saw a couple dogs I liked, and I asked if I could meet them. The couple of dogs I met didn’t feel aligned for one reason or another, so I went to one of their public adoptions at a local pet store in Santa Monica. I walked in and walked by 3 or 4 crates, and when I looked into this one crate, this sweet blonde brindle pup eating a bone looked up at me, and our eyes locked. I knew I needed to meet her. 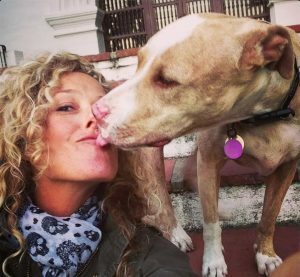 I asked the rescue founder if I could, but she said that this particular dog wouldn’t be a good match for me because I wanted a dog that could go to the dog park or live with other dogs, and this dog needed to be a sole owned dog. I didn’t care. I knew I needed to meet her. They brought her out into the parking lot and her foster mommy was there. I knew right away I wanted her when she climbed into her foster mommy’s lap and curled up with her. She was the sweetest thing and her name was Pumpkin. I took her home as a foster, and we all know how that story goes; I quickly became a foster failure and this sweet girl named Pumpkin was my new baby, and I officially adopted her on Halloween! What is the #1 thing you love about being a doggy momma? To be able to connect unconditionally to another being on this planet who accepts and loves me no matter what! We hike, go on morning beach walks, cruise around town, play ball, lay on the floor and snuggle. Pumpkin sits by me when I do my morning meditation. She is my partner in crime. I am a vegan chef and the moment I take the cutting board out, pumpkin is there waiting for her raw vegg ies. She loves raw broccoli, cauliflower, yams, carrots, kale…but she hates bananas! What are your favorite health and/or pet products that you cannot live without? What is the biggest gift you have experienced being a doggy momma? The amount of love and healing my sweet girl provides is untouchable.